A Pinterest page writing activity can be a great way for students to summarize and share key information on a topic you have been studying in class. 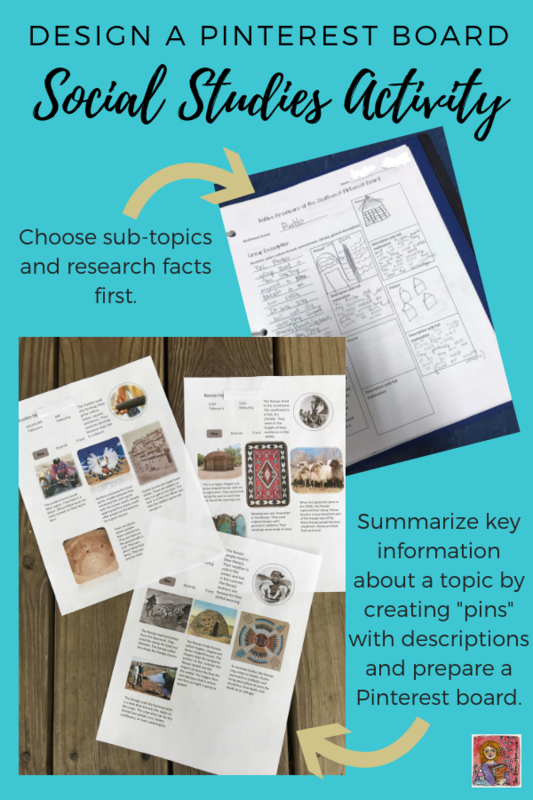 My students recently designed a Pinterest page to show what they learned about Native Americans in the Southwest, but I have also used this writing activity with novel studies. My students were able to double up on some technology skills too, but the activity could be used with a printable template and handwritten if you don’t have access to computers. I started the activity by giving my students THIS PLANNING PAGE in order to brainstorm. They chose the Southwest group on which they wanted to focus, selected four sub-topics based on our class readings and notes, and jotted their notes down on the planning page. Students needed a general description of the Native people that included the region and climate where the people lived. This is the equivalent to the profile information in a real Pinterest account. Next, students sketched a simple drawing of the item that would be the image for the pin and a brief description (about three sentences) for the image on the planning page. Each pin represented a specific aspect or attribute of the Native American group. 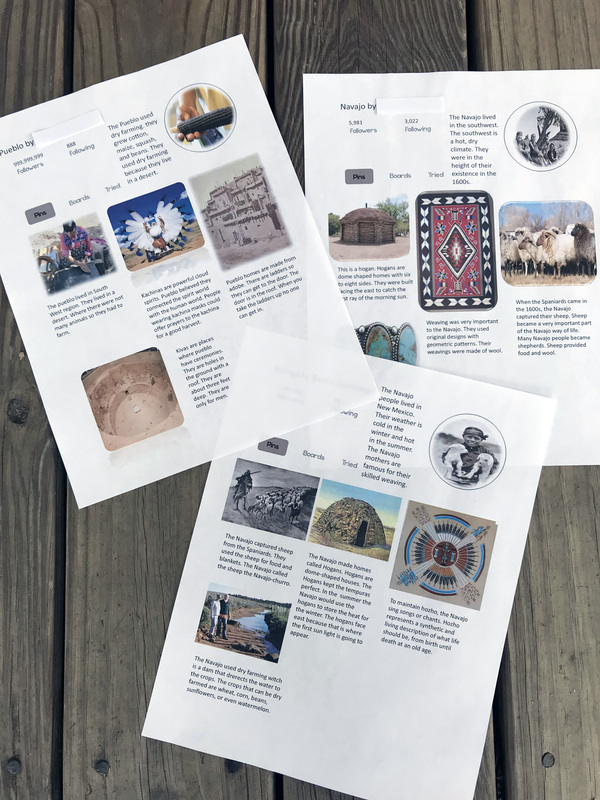 For example, my students who were creating a Navajo Pinterest board might have pins for weaving, a hogan home, turquoise jewelry, or sheep because these were some of the key details we read about in our textbook and supplemental readings. Since we were also reviewing how to identify topic, main idea, and details, many students recognized how this project broke their information into topic (the name of the board), main idea (each pin topic), and details (the description with the pin). THIS PINTEREST TEMPLATE could be used for any social studies topic. Students open the PowerPoint document and click in the text boxes to add their text using the ideas from their planning/brainstorm page. They can delete the blank rectangle image place holders and insert their own images or leave the rectangles, print, and hand draw pictures. If you want students to handwrite the entire activity, use THIS PRINTABLE TEMPLATE. The character Pinterest page is a unique writing activity for students to share what they know about a favorite book character. It requires students to identify key character traits and design a board that represents the book character. 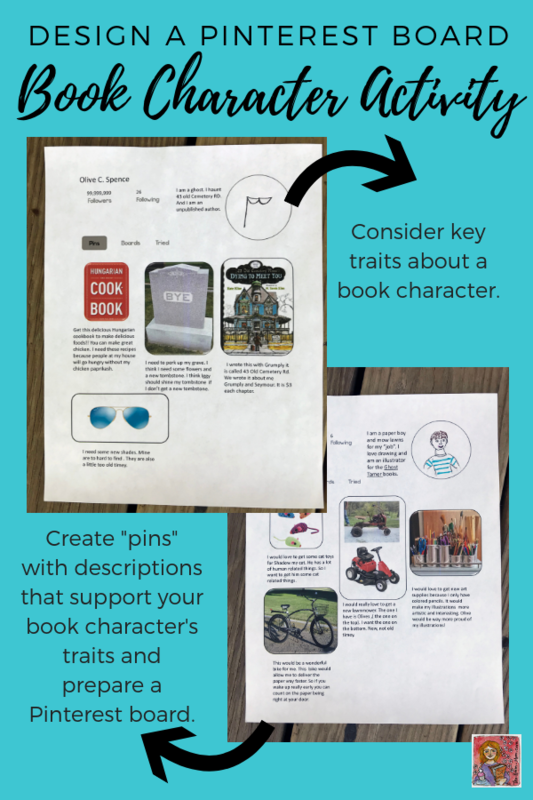 I tried this activity for the first time last year, and it was a good challenge for the students to explain why a character would choose to “pin” a certain item. The thinking process involved in designing the character Pinterest page was more involved than it appears at first glance. I give the students THE PLANNING PAGE. They choose a key character from a book and think about specific traits for that character. The trick is to identify traits that define the character and translate that into a pin image with a description that shows understanding of a character. For example, Charlotte in Charlotte’s Web might pin the latest edition of a thesaurus because she needs word ideas to help Wilbur. We created Pinterest boards for the main characters in a graphic novel called Dying to Meet You by Kate Klise. Next to the profile picture, students wrote a general description of the character and then dug deeper into the character with the pin choices and descriptions. THIS CHARACTER PINTEREST TEMPLATE could be used for any novel or story. If you want students to handwrite the entire activity, use THE PRINTABLE TEMPLATE. For even more fun writing activities you can use in your classroom, CLICK HERE.